Wash and Pat dry the Bhindi. Trim the edges and cut them into 1" pieces. Season with Salt & add chickpeas flour to the cut Bhindi/Okra.Toss it well and allow it sit for 10 minutes. Heat oil in the pan and fry the okra in batches over medium heat.This process can take 4-5 minutes Once the Bhindi is crispy on the outside, slightly brown, drain them to a paper towel. In a large mixing bowl/ jug add yogurt, chickpeas flour, salt, turmeric powder, chilli powder, cumin powder. Whisk them well until well combined. Add water to the yogurt chickpeas mixture in a slow pace and whisk them until well combined. Heat Oil in a large Pan, add cumin seeds, fenugreek seeds, asafoetida. Once cumin seeds begins to crackle, add finely chopped green chilly and ginger garlic paste. Saute for a minute or so until the raw smell is eliminated. Add the chopped red onions, a pinch of salt and saute until translucent. Add the Kadhi Mixture prepared above and allow the mixture to boil, stirring continuously. This process can take roughly 12 minutes+. Reduce the flame, allowing the kadhi to simmer for another 5 minutes or so. If you find the kadhi too thick, add more water. Add the fried bhindi to the kadhi and cook for another 2 minutes. Switch off the flame and ladle them to the serving bowl. Heat Oil/ghee in a small fry pan add mustard seeds and red chillies. Allow the mustard seeds to crackle. Add the curry leaves and turn off the flame. Add this seasoning mixture to the Bhindi Kadhi. Serve them immediately. 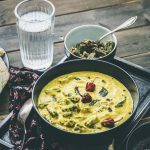 If you are planning to serve Kadhi Later, I would ask you to add the Okra/ Bhindi later to the Kadhi. Washing the Okra and drying them with a towel before chopping helps in ensuring okra is not slimy.